We talk. And laugh. And talk. And laugh. 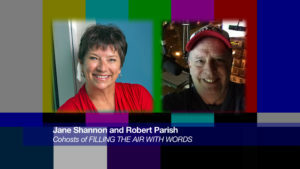 From 2011-2013, long-time BFF’s (and award-winning broadcast journalists), Jane Shannon and Robert Parish recorded a series of conversations about life, aging gracefully and the pursuit of happiness. Their bi-coastal banter became a podcast series they affectionately called FILLING THE AIR WITH WORDS. For a number of unexpected and disappointing reasons, the original series had to be placed securely in a vault, until circumstances allowed the project to be released. Very sadly, Jane passed away unexpectedly in August 2015. As a way of forever honoring her memory, huge intellect and amazing humor, Parish and Jane’s family made the decision to begin posting produced episodes of FILLING THE AIR. Episode 1 is posted below. We all hope you enjoy hearing Jane’s wonderful voice again. RIP Jane. FILLING THE AIR WITH WORDS is available (for free!) on Soundcloud, iTunes, Stitcher, Twitter and Facebook.